Oh my god. You don't know how much you helped with this entry. If I could jump, rest assured I would. Thank you thank you thank you so much! I would report on the progress later on. I took your advice and trimmed some bottom leaves off. I did this before this post, so I didn't go five up. Mine are going crazy anyways and have been trimming them back for a while. Have to in my little city garden!! Thanks for the tips on tomato trimming. My patio garden is in desperate need of a leaf cut. I hadn't noticed my flowered basil being much stronger than usual, but after about a week, it starts to taste bitter. I have been using this pesto recipe for aeons. Can be made by hand but better with a blender or (best) food processor. It's from the old Time/Life cookbook (Italy). 2 cups fresh basil leaves, stripped from their stems, coarsely chopped and tightly packed. In a blender or food processer, combine basil, salt, pepper, garlic, nuts and 1 cup of olive oil. Blend at high speed until the ingredients are smooth, stopping every 5 or 6 second to push herbs down with a rubber spatula. The sauce should be thin enough to run off the spatula easily. If too thick, blend in as much as ½ cup more olive oil. Transfer the sauce to a bowl and stir in the grated cheese. Poach chicken breasts, cool and cut into bit size pieces. Add a few spoons of pesto and mix well. Serve on lettuce or as part of an antipasto. You can also mix the chicken and pesto with cooled pasta and fresh tomatoes for a delicious main course. Serve with French bread. The only time I have noticed my basil getting "sharp" or stronger, is when the stems have turned woody. I do not like the lettuce after it has bolted, but I didn't think it was the same for basil...! i have never noticed a difference with blooming basil. do you have any concerns with trimming and blight? 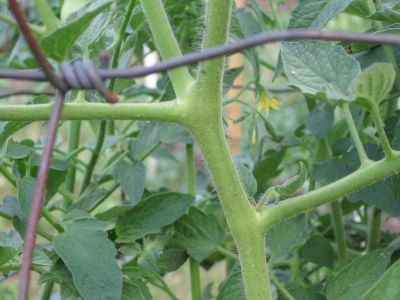 i was under the impression that any wound on a tomato plant invites fungal disease, which is already present in the soil. we are about to make pesto, too! i need to freeze it in something larger though- an ice cube's worth does me no good! 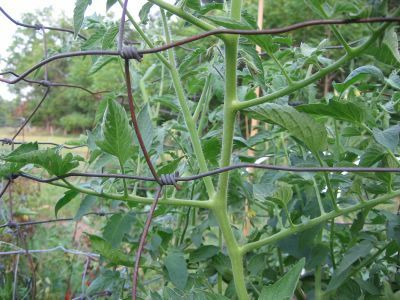 That's funny, I've always pinched out the small growth in between the main stem and the side stem - called "suckering" the tomatoes where I come from. I didn't this year and I wish that I had. I'll pay attention to taking the leaves off the main stem next year too. I make pesto from bolting basil all the time and it's always fine. I pinch those little suckers and pinch and pinch and still can't keep up. OK, I'm the only one here who reports absolutely nasty bitter pesto made from basil gone to bloom. Hmm, alliteration. Blooming, bolting basil brings bitter, pungent, pathetic pesto. I did in fact let my plants go last year; didn't harvest sufficiently till the end of the summer. At that point, what does one do but make pesto ;-) I'd been deadheading but not harvesting, and then finally gave up on deadheading. And the pesto was just nasty. I can't even use it. I suppose it's possible that if I'd harvested it throughout the summer it might have changed things, but I can't say, I don't have that much experience. Karma has caught up with me this year and for the first time ever, in one short month, I had a slug onslaught as well as some other bugs munching my basil from above, and then another furry critter got to it, so my lesson next year is harvest, harvest, harvest. Anyway, cast my vote for icky pesto with flowering basil. thanks a lot for posting your experiences on tomato trimming! I agree with most of what you said, but I must say that different strains of tomatoes react differently on trimming. Love the homemade tomato cages! Meanwhile- here's the main difference between basil flowering and not in practice. (Note: the type of basil makes a difference too but that is more matter of taste) - Pesto from flowering basil is just fine but will be stronger (less sweet), and leaves more stringy. So for those that go pesto "crazy" and are using a home blender (and not a high powered food processor)- you will find it more challenging to break down to the consistency you want. Also, some folks dont care for the extra "pungency" that stray flower stems tend to cause when they find their way into the processing. Basil pinched back regularly (though I am awful about staying on this myself!) does produce more useful leaf surface - larger leaves, less "stringy" than those not pinched. For making pesto, it does help the whole event move a little faster to just hand shear the nice full leaves as opposed to "hand picking" all those tiny leaves and separating the flower heads and rougher stems. Hope this will help. BTW: Your garden is lovely and full of soul! BRAVO to you! :) HUGS! Great advice. I will have to try that on my plants. Thanks for sharing. water basil this also helps it to be a little more mild. This is wonderful if you love pho soup, Asian beef noodle soup. Hope I spelled that right. I also have stopped deer from entering my garden. The orange net like fence material that you see on construction sites and around utility work is wonderful. You don't stand it up but lay it on the ground. I have been deer free for over three weeks now. Good luck and great gardening. When using fresh garlic always be sure to remove that little green growth in the middle of the garlic clove, this will also leave a bitter taste. MMMM, use those pinched off flower stalks to make your car smell good, or any other place you want to make smell good! Bathroom, in the linen cupboard, under the stairs storage area....the car heats up and makes the Basil flowers wilt quickly, but also causes the release of the fragrance - even helps cover up cigarette smoke smell. I haven't noticed any flavor change after blooming in the leaves of our basils, but then I'd eat it anyways!